We all deserve a drink after this year’s election. The stronger and bloodier, the better. If you’re on the hunt, try the shockingly delicious combination of spicy black pepper, savory tomato, and lip-numbing Tabasco sauce…the Bloody Mary. Which in turn will draw you towards the bathroom, sloppily spinning in circles, blaming and muttering all at the same time, “Bloody Mary, Bloody Mary, Bloody…”. If you’re a lucky son-of-a-gun and a ghost didn’t appear to you in the mirror after the third repetition of “Bloody Mary”, then you’ll be left with the scary notion that you just drank vegetables: tomatoes, onions, and celery to be exact. Why is it called a Bloody Mary? And does it have ANY connection to the Bloody Mary folklore? For starters, the Bloody Mary drink is 82 years old. It was supposedly created in the 1920s by a bartender in Paris, working at a New York-style bar, trying to appease a wave of Russian immigrants with tomato juice and vodka. What a brave soul. By the 1930s, the bartender’s—his name was Ferdinand Petiot, if you’re curious—drink got so popular that the man was shipped off to the Big Apple, where Americans demanded more spice be added to the now popular “hangover cure”—hence the addition of Worcestershire and Tabasco sauce. SO WHAT ABOUT THE NAME? There are many renditions on how the Bloody Mary got its name. Believe what you will. At the bar in New York, they called it the “Red Snapper” until someone randomly thought back to the 1550s and remembered Mary Tudor, Queen of England, who liked to kill Protestants, and the name changed to “Bloody Mary”. Go figure. Third times the charm (pun intended): it was an American attempt to say the Russian word “Vladimir”, for whom the original drink was made for—Vladimir Smirnoff [this one’s a reach]. In the end, all that matters is that Ernest Hemingway had his own personal recipe. FINAL NOTE: It’s truly hard to find a good Bloody Mary. I have searched long and hard and have visited many, many states, but to seemingly no avail. Until now. I found a deliciously different Bloody Mary at the Hog Island Oyster Company, located in San Francisco, California. Below is my rendition of their gem of a drink. Chop it up. I like to chop all of my ingredients at once to save time. I suggest making the Hog Wash first, since it requires the most chopping. Mince the shallot or onion, mince the jalapeño, and finely chop the cilantro. Add to a small mixing bowl. *Note: grate the onion or shallot for a smoother drink, with fewer chunks. Add the “Wash” to the Hog Wash. Add the rice vinegar and lime juice to the onion, jalapeño, and cilantro mixture. Mix with a fork, then set aside for now. Bloody it up. In a medium-mixing bowl, combine the vodka, tomato juice, Worcestershire, lemon juice, horseradish, Tabasco sauce, celery salt, salt salt, and pepper. Taste the mixture and add extra parts as needed. *Note: the original recipe specified 5 cracks of pepper, but I found that even 7 cracks weren’t enough. I also like spicy Bloody Marys, so take this with a grain of salt (and pepper). This is a solo cup shot glass. Adorable, right? The final touches. Grab a tall glass and fill it with ice. The more ice the better, as a Bloody Mary should always be served crisp and cold. Add additional ingredients such as a stalk of celery, a cube of cheese, a stick of meat, or a pickle. Or you can go with the original recipe and use pickled vegetables or olives. 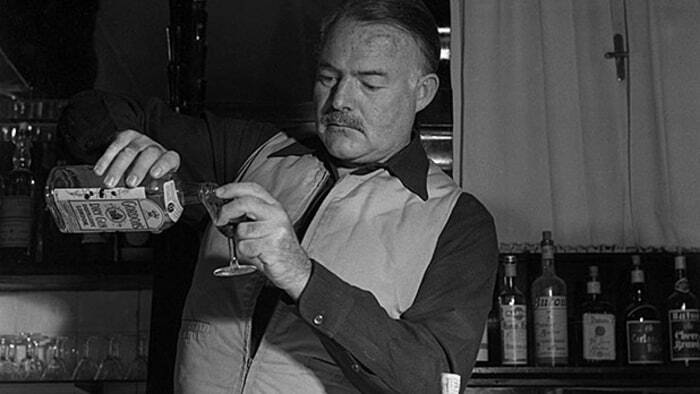 Drink like Hemingway. Add the Bloody Mary mixture to the glass and top with the Hog Wash. Enjoy! SERVE WITH FRESH OYSTERS. THANK ME LATER. Not a bad clean-up at all. Word of advice: don’t use white kitchen towels while crafting this cocktail. That tomato juice gets everywhere. In fact, make sure you’re wearing a red or dark shirt too. Want to see the ghost of Bloody Mary? Click here if you dare. Want to see Sam and Dean Winchester again? Clicks. Mr. Hemingway drinking? You know you want to see this.